As we like to share our interests we also are pleased to hear from others with similar interests. Please use the link at the bottom of the pages to contact us by email. We will do our best to get back to you promptly. We are the authors of a set of five books on Measuring the Weather. We were pleased when in 2008 we had the opportunity to update them for a new edition. There are five books in the set and they can be found in many libraries in the UK, North America and Australia. They are aimed at children aged 8-12 years of age but are very readable for adults. They are full of colourful pictures and diagrams, interesting facts, things to do and references. Many thanks to Richard Sanders for his patience in training us in the use of Dreamweaver and for helping set up this site. It is always advisable to complete weather projects under responsible adult supervision. Most science work should not be done by children on their own. Weather apparatus should be handled gently as it can be expensive. Take care as well because, should anything break, pieces can be sharp. Please be conscious of any safety issues regarding weather activities. Always refer to any relevant Health and Safety policy documents. It is advisable to avoid any instruments which contain mercury. Encourage weather observers to avoid looking directly at the sun when looking at the sky, especially with optical instruments such as binoculars and cameras. Filters are generally not powerful enough to guarantee safe viewing of the sun. The links on these pages were appropriate when they were selected, but web sites do change. Use your e-safety skills when using the internet. If you see something you feel uncomfortable about, tell an adult. We will endeavour to update these pages as time and circumstances allow. We hope that you find these items interesting. Thank you for your time. Whilst we have done our best to be accurate at all times, we will not be held responsible for any loss, damage or inconvenience caused as a result of any inaccuracy or error within these pages. All activities need to be carried out with care, and we cannot be responsible for any mishaps. If you decide to make your own weather box our instructions for the various types of homemade weather boxes are only intended to be guides. They are intended to be made by adults taking sensible safety precautions. The user is responsible for his/her own wellbeing and safety. There are two types of cloud in this picture. 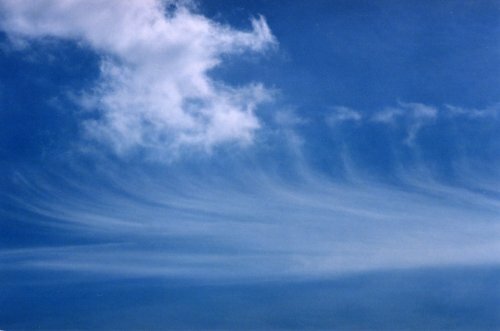 The delicate ones are cirrus. The fluffy ones are cumulus. Look on the Clouds page and see if you agree with this.